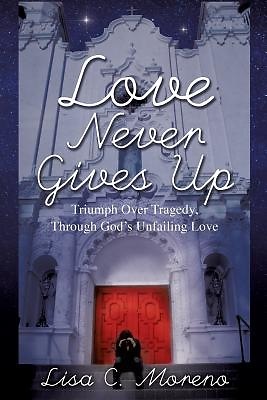 Love Never Gives Up, is a vivid account of a woman's family history of abuse, adultery, addiction, and the cycles of hope and hopelessness endured in her life and healing. Lisa Moreno shares her account of growing up with an emotionally volatile father and the abuse experienced as a child, witnessing addiction and her volatile emotions experienced in her close relationships. She gives you compelling insights she has learned on marriage, addiction, love and boundaries with scriptures for daily study. Moreno's relationship with God later proves to be the deliverance through her rocky marriage and her source of strength, giving her increased faith and spiritual endurance. Moreno's testimony is an absorbing account of her powerful transformation through abuse, and the enduring nature of love, which provides hope and healing through life's bleakest circumstances.